A Reformed evangelical author/pastor posted this on FB. Since Gin is my favorite, I thought I’d share. 1. Gin contains natural ingredients. Of course, every gin is made with a different combination of ingredients, but besides the main berry, juniper, gin can include coriander, sage, cassia, nutmeg, rosemary, and angelica root. It’s like a much more fun version of the paleo diet…right? 2. Juniper berries are jam-packed with health benefits. The main ingredient in gin is taken by many people as a daily supplement due to it’s medicinal properties. It combats infection(gram-negative and gram-positive bacteria), renal insufficiency, bad coughs and lung congestion, and can jump start a late period. 3. It’s a natural remedy for arthritis. The stuff that helps chronic conditions is found in gin and cantherefore help with loss of tone in tissues and organs, as well as joint pain, gout and rheumatoid arthritis. Many people haverecently started to eat gin-soaked raisins at night as a homeopathic formula to keep inflammation at bay. 4. It can help eliminate wrinkles in your skin. Alcohol, in general, contains antioxidants, but the added juniper-boost aids your body in regenerating cells, which in turn is great for maintaining smooth, line-free skin. 5. It fights kidney and liver disease. Gin contains diuretic ingredients, which eases kidney filtration and therefore helps get rid of bad bacteria. 6. A gin and tonic can help prevent malaria. This doesn’t mean you shouldn’t get shots before travelling, but the cocktail was used in the days of the British Empire to prevent catching the disease that was ravaging both its colonies and colonizers. Quinine, which is used to make tonic water, was consumed religiously by English colonial people in order to stay healthy, and it didn’t take too long for people to realize that adding a bit of gin would make the tonic water a little more exciting. 7. Your digestive system will thank you. The bitter herbs contained in gin can cause increases in digestive enzymes and stomach acid secretions, which helps break down food quickly and improves digestion. The high antioxidant levels in gin help to “neutralize free radicals in the body,” which are some roots of cancer. These same kinds of benefits are found in fad drinks like kombucha, but wouldn’t you rather skip the ‘buch and get tipsy? Gin happens to be one of the least calorific types of alcohol atabout 97 calories per 1.5 ounces. Since your digestive system is being revved up by the juniper, you’re also less likely to bloat and develop a urinary tract infection as it helps flush out toxins. That’s the kind of cleanse we can get behind. 10. A decent gin will not cost you an arm and a leg. 11. Frank Sinatra liked it. How much more classy can you get? Well, the Christmas Season is almost upon us. Since, ya know, it is the first week of November. Anyway, I know many people start their Christmas shopping early and I want to make it easy on you, dear readers, to know what to buy for me. I’ll make it simple: I’ll ask for ONE gift that you can all pitch in to buy for me. You don’t even have to wait for Christmas to give it to me. Actually, please don’t wait that long. I need it by November 30th. 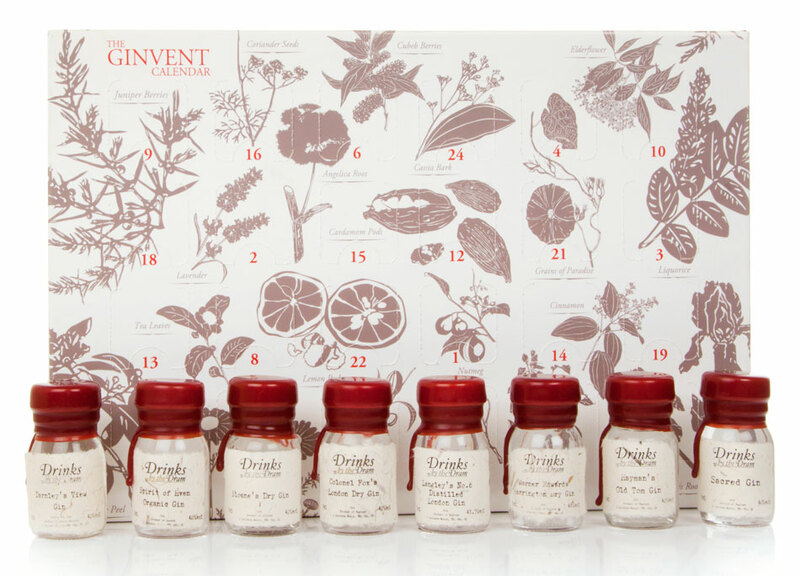 Without further ado I give you the Ginvent Advent Calendar! Advent has never been so much fun!